If you put three computer monitors on a dining room table talking to each other, how will you know when the play is over unless someone comes along to shut them down? 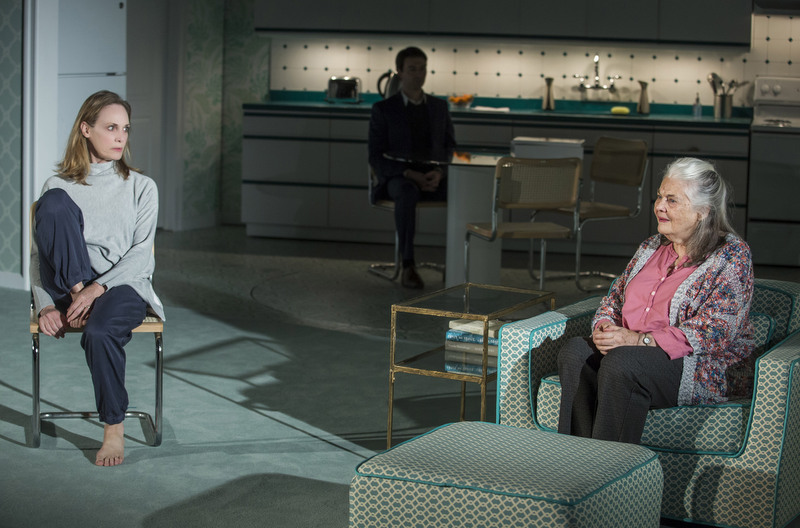 That's one of the questions raised by Jordan Harrison's Marjorie Prime, at Playwrights Horizons. Harrison starts with an interesting idea and an interesting setup. 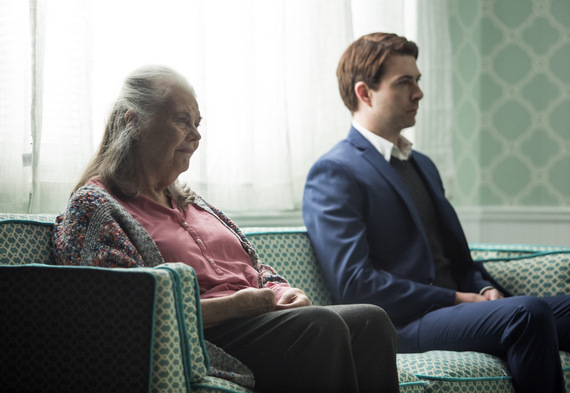 85-year-old Marjorie (Lois Smith) is having a conversation with what seems to be her husband Walter (Noah Bean) -- seated what seems to be miles away, on Laura Jellinek's eerily spacious set -- and looking about fifty years younger. The conversation is disjointed, purposefully so. The rote and colorless Walter is having a conversation with Marjorie, who is clearly approaching dementia, but he seems to be feeding her the information as they go. The theatre program mentions artificial intelligence, so I suppose there's no reason not to discuss it here. But artificial intelligence is one thing; artificial playwriting, alas, is another. That's not to say that Mr. Harrison's writing is artificial. His setup, though, allows him to spoon-feed information to the audience by having his A.I. characters -- "primes," he calls them -- feed us backstory, either accurate, made-up, or misprogrammed. Marjorie is losing her mind, literally so; by the end of the play she will herself become one of these walking, talking computer screens or "primes." (The play title tells us as much.) The long-dead Walter is a monitor from the start; Marjorie's daughter Tess (Lisa Emery) eventually gets there as well. The fourth character is Jon (Stephen Root), the husband of Tess who has far more patience with poor Marjorie. As the eighty-minute play progresses, we get more and more back story; that is, one or another character "reminds" someone else of the time they did this or that. The plotting is such that at times we are reminded of a non-violent, non-alcoholic variation on Who's Afraid of Virginia Woolf? somehow mixed up with "Ordinary People" and Next to Normal. Except that what is provocative in those works is not so, here. The savior of Marjorie Prime is Marjorie; or, rather, the actress in the role. Ms. Smith has been gracing our stages since 1952, when she was a contemporary of Julie Harris, Maureen Stapleton and Geraldine Page. (She played Laura to Helen Hayes' Amanda in City Center's 1956 Glass Menagerie, while film roles include "East of Eden," "Five Easy Pieces" and the forthcoming movie version of this very play.) She is still hard at it at the age of eighty-five -- she gave an equally skilled performance in Annie Baker's John, at the Signature Center in July -- and has demonstrated the ability to light up any stage and any play. Ms. Emery (Relatively Speaking) is strong, Mr. Bean plays the walking computer with a properly mechanical style, and Mr. Root is impressive as he tries to grapple with the family tragedies at hand. Anne Kauffman, of Detroit and The Nether, directs. Lisa Emery, Noah Bean and Lois Smith in Marjorie Prime. 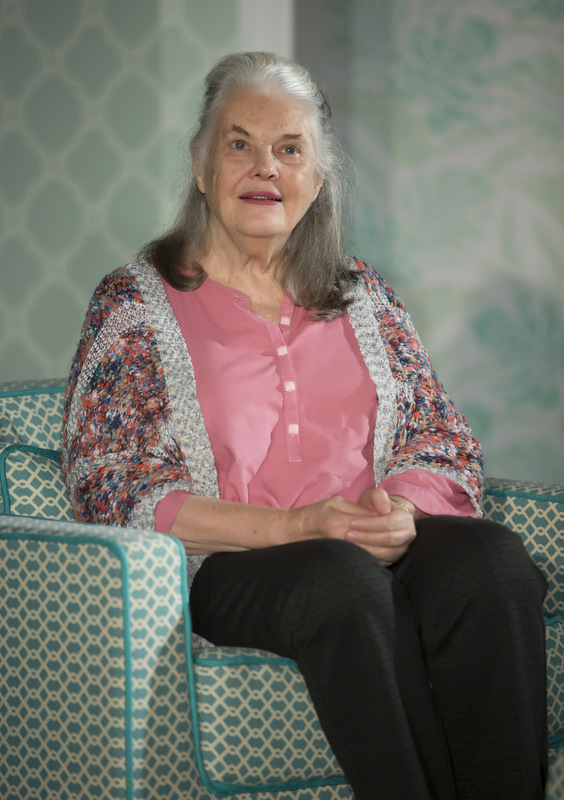 Chalk Marjorie Prime up as another prime lesson in acting from Lois Smith. This time, though, her vehicle is Grade B+.